Film news is pretty much like every other type of news these days, too much information. For every story you care about, you have the sift through what seems like a hundred that you could really care nothing about. So what we do is train our ears and eyes to catch the things that matter to us, so when I saw that Steven Soderbergh was directing a film for Netflix my attention was caught. If I could I would watch Soderbergh direct my funeral, not for me of course, I’d be dead, but because he tends to make everything better that he is involved with. 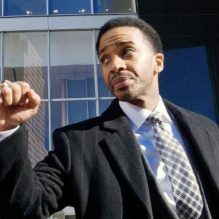 Now that that truth is out there we can talk about High Flying Bird, the story that brought Netflix and Soderbergh together. Ray (André Holland) is an agent for a basketball rookie named Erick (Melvin Gregg), who are both eagerly waiting for a lockout to end so that they can both do what they do best. Things though seem at a standstill and that causes Ray to put a new plan into play, a plan that intends to nudge all who are involved to a solution. The players involved are Ray, his assistant or ex assistant Sam (Zazie Beetz) , Erick and the representative of The Players Association and an owner of a team. You never know the hand that Ray is holding, and you only find out when Soderbergh and writer Terell Alvin McCraney (Moonlight) decide to show you everything that they are holding. From the opening shot you are more than aware that you are in Steven Soderbergh film, and High Flying Bird never lets you forget that for the entirety of the of the film. Soderbergh has a way of making you feel like you are in the film and not just watching something on a screen. Everything is graceful and immersive, but that feeling is enhanced by watching Holland who hit big with last years Castle Rock deliver McCraney’s words that seem to give then new meaning. It’s one thing to make a clear point on the page, but it’s another to perform it. Holland is an absolute joy to watch as he takes command of your attention from the opening scene all the way to the final frame. The rest of the cast serves their parts, but it’s the Holland and Beetz show, with the later matching Holland beat by beat with precision. The story has a feel of truth to it, which is enhanced by the appearance of three current NBA players who tell you their own stories about entering the league. High Flying Bird lets you peak a little behind the curtain of the life of a professional athlete, and because of Holland and the two driving forces behind the camera, it goes for the three and nails it.